The new 2012 diary template is now ready. It is available in two versions: the US version weeks start at Sunday and the non-US version weeks start at Monday. Visit our templates section for download and installation instructions. If you already own MyInfo 6.x, the upgrade to version 6.04 is free – you will receive update instructions on your email. MyInfo 6 is here! Yep, if you are already MyInfo customer you know about it. But for the rest of you it’s news. And the waiting is worth it, believe me! So, what’s new in MyInfo 6? This is a convenient command that allows you to focus on a specific part of the topic, by hiding all documents that are not important to you in the moment. Just select a document in the tree, click Hoist, and all documents that are not children or direct parents of this document will disappear from the tree. 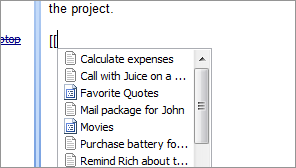 This was another very popular feature demand: add reminders to the documents. Here we go: in this version you can assign a reminder to any document and if it is open in MyInfo when the time comes, it will show up in the Reminders dialog. Many people use MyInfo for research and writing and they find it hard to work with two documents from the same topic in MyInfo 5. That is why, we’ve included multiple document windows support in MyInfo 6. If you click on document title, it will open as separate, read-only windows, which you can view while editing another document in the same topic! And you can open as many documents as you want. We’ve greatly improved linking between documents in MyInfo 6. Now you have two easy ways to link to other documents. Now, just select any of them and MyInfo will create a link to this document in the text editor. And if you prefer using the Insert Hyperlink dialog for this purpose, you will be pleased to learn that it now allows you to link to documents in other open topics too! Don’t know what Unicode is? Don’t worry, it’s just a fancy word, which means that MyInfo now works with multiple languages anywhere in the application. You can mix Latin, Cyrillic, Chinese and any other characters in the text editor, tree, attributes, filters and topic file names. In this version, if you export MyInfo topic as RTF text file, it will retain its documents structure. Open it in Ms Word, go into Outline mode and you have your outline as it was in MyInfo. The other way is possible too: export Ms Word document as RTF file, import it in MyInfo, using Import > Ms Word outline, and MyInfo will create a nicely looking topic, preserving the Word document hierarchy. MyInfo workspaces allow you to save your working session and restore it later. It remembers all open topics and document windows for a later re-use. They are handy, if you group your topics by a theme, so for example you can create “Project session” with all topics related to this project and open them anytime you like. Extra security is always welcome. This is why, starting form this version, MyInfo will keep two backup copies per topic. The second one (.verified) will be created only after the topic is successfully open, thus preventing corrupt MyInfo topics from overwriting good backups. As always, you can try out a full featured, 28 day trial copy of MyInfo 6 from our download page. Just a quick reminder that MyInfo 5.50 is under way.. 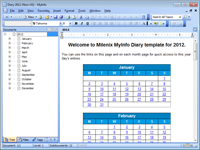 The new 2011 diary template is now ready. It is available in two versions: the US version weeks start at Sunday and the non-US version weeks start at Monday. Announcements / MyInfo / Releases — Comments Off on Meet MyInfo 5 – new release! Meet MyInfo 5 – new release! We’ve have exciting news today! We are pleased to announce that the new version of MyInfo 5 is available to the public. It may be not a news for you, if you are already our customer, but it is news for the people that are not yet our customers. You can download the new version here. We have full list of what’s new in MyInfo 5, but here is a quick overview of our favorite new features. What are yours? Links to paragraphs – People use MyInfo not only to store notes, but also long documents. It was impossible to link to specific place in a long document in the older versions of MyInfo, but now you can do that easily. View files directly in MyInfo – We have expanded our internal browser to support a bunch of file formats (Adobe PDFs, Ms Office files, images and text files), allowing you to view the embedded copies of these files without leaving MyInfo! Spelling in any language – MyInfo 5 now uses OpenOffice.org spelling dictionaries. And since it is the software with the biggest number of dictionaries available, you have access to spelling dictionaries in more than 100 languages! What will happen in the next 10 years? We’ll love to hear your feedback! This is a service update, which contains only bug fixes. It resolves a couple of problems found in MyInfo 4.30. We strongly recommend upgrading to this version. If you already own MyInfo 4.x, the upgrade to version 4.31 is free – you will receive update instructions on your email. We are pleased to announce that MyInfo 4.30 is now available as free download to all registered users of MyInfo! This new version includes exciting new features and a handful of fixes and improvements. Improved search We have rewritten the search feature from the scratch and now it is faster, more reliable, more powerful. It is now integrated with attributes, so you can search for text in comments, tags and other fields. Learn more about the new search. Improved web capture MyInfo now handles pasting from browsers better and preserves the page layout. In addition, you can now select specific topic where to send your snippets, if you want an unified place to store them. Changed MyInfo no longer supports Windows 98 and Windows Me. This is caused by a use of the searching technology, which does not support these operating systems. Our research shows that under 1% of our customers use these OSes, so we’ve decided that it is a fair decision. If you already own MyInfo 4.x, the upgrade to version 4.30 is free – you should receive download instructions in your email soon. If you haven’t bought MyInfo yet, the newest version gives you good reasons to do so. Why not download the trial version right now? The upcoming MyInfo 4.30 brings some exiting search improvements to MyInfo. MyInfo search was always fast when working with small files, but as the files grow larger, the search speed slowed down considerably. We have worked hard to overcome that limitation and we are proud of the results. In MyInfo 4.30 it doesn’t matter how large the file is, the search will be always fast! The other bottleneck in pre-MyInfo 4.30 search was searching for phrases. We will not get into technical details here, because they are not interesting, but the fact is that in versions prior to MyInfo 4.30, searching for phrases was slow. No more! In the new version it doesn’t matter whether you search for keywords or phrases – again, the search will be always fast! The old search supported indexing of up to 4000 documents. This limit is now lifted and it can index as many documents as you have in the topic. We have found some cases where the index was not always up to date in the older versions and fixed these issues in the new release. In addition, if you search in all topics in MyInfo 4.25 and earlier, you have maybe noticed that MyInfo shows no summary text for the topics that are not currently open in MyInfo. This is no longer an issue – it doesn’t whether the topic is open or not, it will always show summary text, if you prefer so. In general, you should experience no problems when working with your native language. MyInfo indexes texts based on your Windows settings, so if you live in Japan, it will index non-western characters as Japanese. However, if you have documents in different languages, they will not be indexed correctly. We have fixed that in MyInfo 4.30, which offers real multi-language support for the search. Now you can mix for example documents in English, Chinese, Korean and Thai, and you will be able to search for any of these texts without any problems. We have also improved the support for Chinese, Korean, Japanese and Vietnam languages, so you will no longer need to put your search terms in asterisks. Previously, you had to search for these terms like this: *??*. Now you can just type ??. By default, MyInfo search for all terms in the search query. OR Find documents that match either of the subexpressions. – Searches only for documents that do not contain the term after the – sign. (expression) Use brackets to create a subexpression. term1 NEAR term2 Finds only documents that contain term1 within ten words of term2. term1 ADJ term2 Finds only documents that contain term1 within ten words of term2, where term1 and term2 are in this exact order. “phrase” Searches for a phrase. field:text Allows you to search in specific field like document text, user attributes, document title and so on. prefix* Searches for all terms that begin with this prefix. Please refer to MyInfo 4.30 help system for more details on the new search syntax. MyInfo 4.30 will be availble by the end of the next week (June 20, 2009).